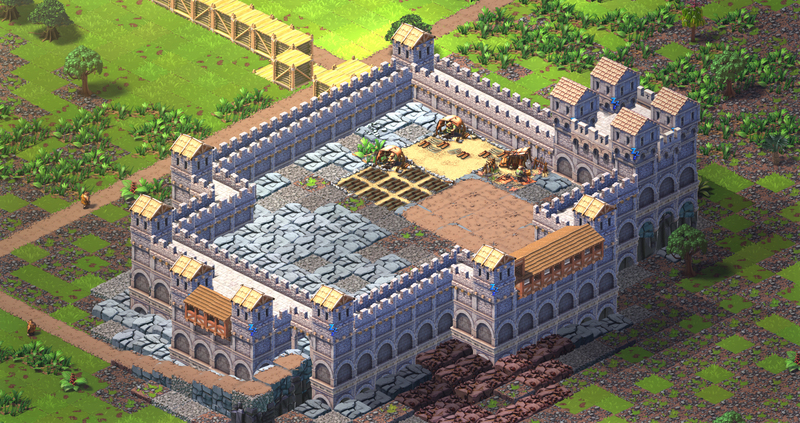 There is now 8 new military structures : 4 types of battlements, and 4 tower buildings. These structures can only be built on platforms. 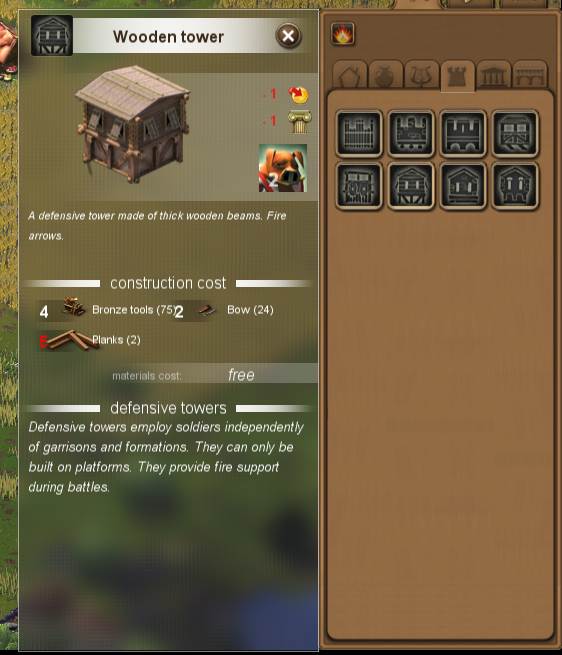 Battlements will provide a defensive bonus to units on the platforms, and towers will act as units of their own providing fire support during battles, but are expensive to maintain and require permanent workers. Using these structures combined with platforms, it is now possible to design pretty cool fortifications, like this castle i previously shared on facebook a while ago. Or a fortified city like that second test, with a tiny fort in its middle. Additionally to these new things available to build, i’ve created a tool i call for now the ” strategic tool”. When activated, you get to see all the troops of all the formations present in your region and you can customize how your region and these troops will react to incoming enemies. 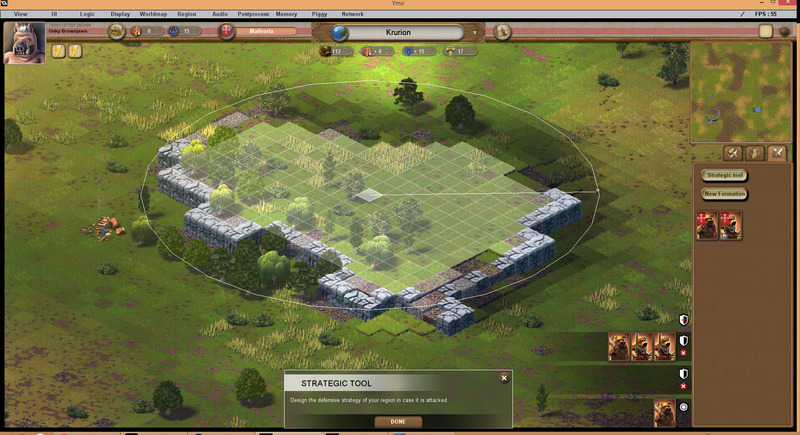 In the strategic tool, you can add “Defensive zones” simply by clicking to set a position and dragging across the terrain to set a radius. These zones will automatically fill the terrain following 2 rules : they do not spread to lower heights, but they spread to higher ones. This way, you can easily and quickly create zones filling hill tops stopping on the cliff edge as well as zones filling walled areas like castles or cities themselves ( the zone will include the wall and then stop at its border ). The point of these zones is that you can then assign troops to it: each troop can be assigned a “strategic mode”, defining its behavior during battle, and being assigned to a defensive zone is one of them. Defending zone : In this mode the troop is assigned to a specific defensive zone. The troop will never exit the zone, but will move within it if necessary. The troop will try to prevent enemies from entering the zone. Range units will move along the edge of the zone to engage any available target. 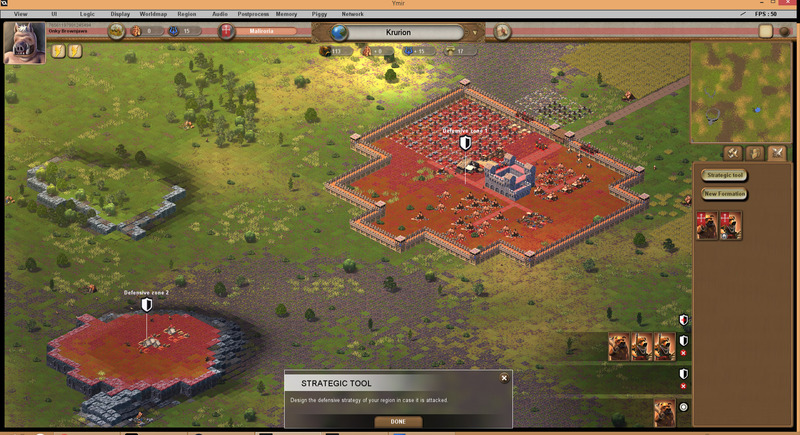 Defensive zones can be superposed, so you can setup successive layers of defenses. Pitch battle : Pitch battle is the basic default behavior. The troops in this mode will automatically deploy to face any incoming army and engage immediately. Restricted engagement : In restricted engagement, the troop has a range of engagement ( that you can define ). The troop will only move to engage enemies when they are within this range. You could, this way, have some troops guarding specific spots (like warehouses) or reacting only when enemies reach certain zones. 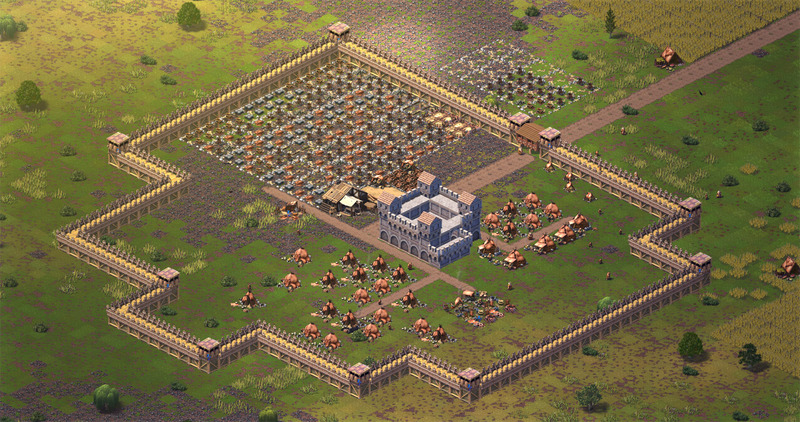 For instance, you could have a defensive zone including all your city and walls with range units, and have some cavalry units in restricted engagement with a range reaching slightly beyond the walls. This way the units will sally out to engage enemies getting near the walls while your range units in defensive mode will support from the walls. 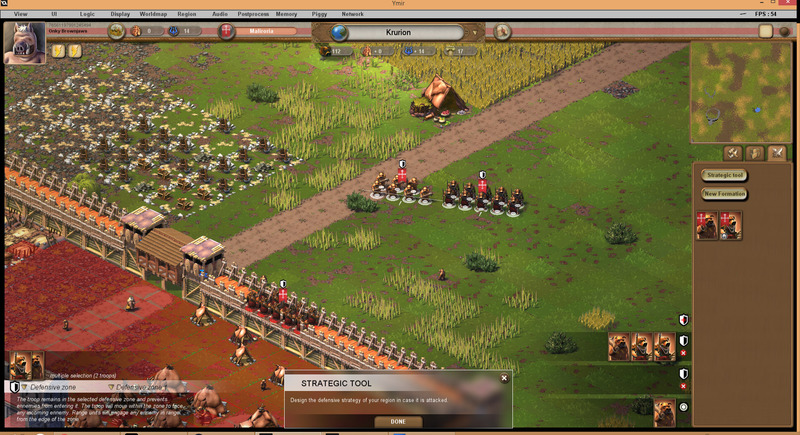 With the strategic tool, you can also select any troop and set its default deployment position. In some modes however, this starting position might be irrelevant : for example troops in pitch battle will automatically redeploy to face the enemy on the edge of the region. 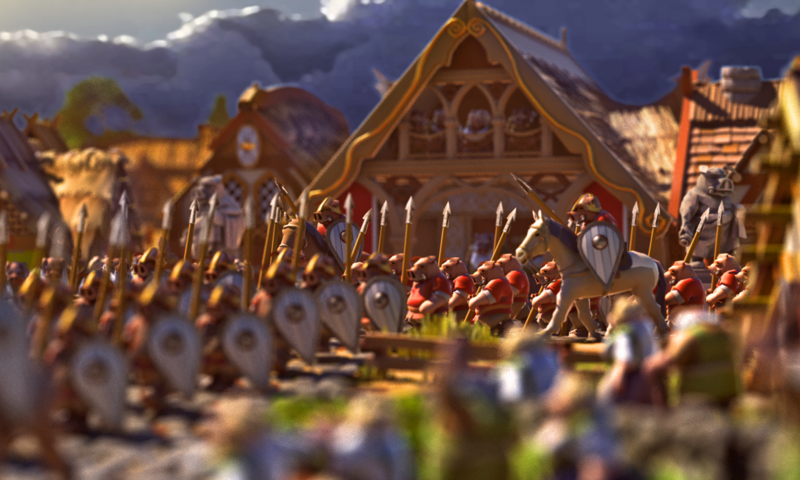 I’ve also added a new military unit: a default warrior unit. It’s basically a pig with a wooden cudgel (the selected troop on the left), and it will be the first available military unit of the game.